Left to right, GCC's Matthew McKinney, Prof. Ashley Anglin and Hannah Martino play key roles in a community production of "The Sound of Music" that runs July 28-31. Germanna Community College Prof. Ashley Anglin jokes that she's looking forward to adding singing soprano in Latin to her resume when she performs with students Hannah Martino and Matt McKinney Thursday through Sunday in a community theater production of "The Sound of Music" at Spotsylvania High School. Anglin is a professor of Spanish and Italian and the GCC Department of Modern Foreign Languages chair. "And she sings it beautifully," says Marilyn Scott, who is the director of the show and of the local Christian Community Theater, a branch of the Christian Youth Theater. This will be the first Fredericksburg CCT show. CCT is all ages. The cutoff age for CYT is 18. Martino, 20, will play the lead role of Maria, McKinney will play Rolf, and Anglin will play Sister Sophia. Austin Fitzhugh, another former student of Anglin's, plays Max. Anna Godfrey, the show's stage manager, is a GCC student who has applied to the nursing program. Anglin earns a 4.9 out 5.0 on RateMyProfessors.com for making learning fun. "We have a competition to see who can be rated the meanest teacher," she says with a laugh. "She is so creative and so funny that she makes learning very easy," Martino says of Anglin. Anglin, who earned degrees at Catholic University and William & Mary, taught at Northern Virginia Community College before coming to Germanna four years ago. The 17-year-old McKinney, who has been a Dual Enrollment student at Germanna, won a GCC award for academic excellence in math. Martino, who has a semester to go, has been a member of the student government. McKinney's character, Rolf, is a teenage boy who becomes a Nazi. The sweet-natured McKinney says playing the role is difficult. "I kind of turn into a jerk," he says with a smile. "It's hard for me to be mean. Hopefully, I can pull it off. I also have to be a flirt, which I really don't know how to do." For Martino, playing Maria comes naturally. "I love being with the children," she says. She has worked as a full-time, live-in nanny and as a tutor." Singing harmony with so many young children is a bit difficult, though, she said. "I grew up with Julie Andrews," she says. She says "The Sound of Music" is her parents' favorite movie. "My dad cries when [Andrews] sings 'Edelweiss.' " she says. Pointing out that Martino's first role was Dorothy in "The Wizard of Oz," Anglin says with a laugh, "My first part was 'dancer No. 14.' "
Martino has been involved in CYT Fredericksburg since she was 16 in 2007. With CYT, she's also been in "Seussical the Musical" (Mrs. Mayor), "Les Miserables" (Fantine), "The Music Man" (Marian), and "Guys and Dolls" (Sarah Brown). She hopes to help disadvantaged children through the performing arts. The Orange County Educational Foundation has honored Germanna Community College's Kathryn Denner with a Teacher Innovation Grant. Denner (left), who is pictured with GCC Dean of Student Services Pam Frederick, will use her $250 award to purchase materials to support high achievement in mathematics as part of her Math Anxiety Reduction grant. She's one of six recipients of OCEF's first Teacher Innovation Grants. The six teachers were selected from among 25 Orange County educators who submitted applications. The grants were designed to assist with the development of projects to increase student achievement, promote tolerance, and exhibit new technology in the classroom. “The Education Foundation was glad to be able to award grants to strengthen the quality of education for students in Orange County,” said Sam Kessler, chair of the OCEF Teacher Innovative Grant Committee. “We are grateful to all the teachers who submitted grant proposals and look forward to offering additional grants in the 2011-2012 school year. Winners of this spring’s teacher innovation grants will be honored at their individual schools and as a group at 2011-2012 Convocation Ceremonies. The recipients, representing five different schools and covering students from kindergarten through post secondary education include Denner, Vickie Baker of Orange County High School, Sarah Duffy of Locust Grove Middle School and Gloria Pullen, Sharon Mohrmann and Carolyn Herndon, all of Orange Elementary School. 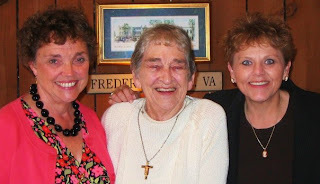 The three deans who have overseen GCC's nursing program: Dr. Jane Ingalls, (left), the late Dale Featherston (center) and current Dean Mary Gilkey. Dr. Ingalls has been appointed to the State Board of Nursing. Gov. Bob McDonnell has appointed a former Dean of Nursing at Germanna Community College to the Virginia State Board of Nursing. Dr. Jane R. Ingalls of Fredericksburg is a registered nurse and Professor Emeritus at Germanna Community College, where she retired as Dean of Nursing in 2009. "I have so much respect for the Board of Nursing staff and the members of the Board," Dr. Ingalls said. She did an internship with the Board of Nursing in 1993, when she was working toward her doctorate. Dr. Ingalls said the function of the board is "to protect the health, safety and well being of the citizens of the Commonwealth of Virginia," through both practices and the education of future nurses. "That's a pretty important task. I'm just really honored to be appointed. It's a real opportunity for me to serve." 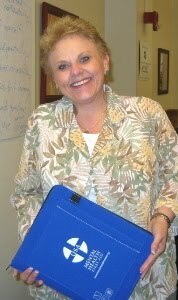 GCC Dean of Nursing Mary Gilkey R.N. said the Board's mission of assuring "quality patient care delivery by caring and competent caregivers" is dear to Dr. Ingalls' heart. Gilkey said Dr. Ingalls' experience as a nurse educator and care advocate "will serve all Virginians well ... and, most assuredly, assist us all to best define the future of nursing." Trula E. Minton of Richmond, Chief Nursing Officer at CJW Medical Center. A group of rising ninth-graders began Germanna Community College's week-long Launch into Leadership summer camp program for rising ninth-graders today. Launch into Leadership provides an introduction to key leadership skills that are valuable in any situation and relevant tonew high schoolers. Rising freshmen are exposed to some of the challenges and expectations they can expect in high school. They prepare for participating in and leading student and organizations and also develop improved confidence, communication skills and raising consciousness about the impact we all have on one another. Verbal and written communication and body language. Assignments including writing a daily journal entry. The development of a personal mission statement that includes long- and short-term goals and a plan to achieve them. Creating a PowerPoint presentation that students may show families at the closing session. Germanna Dean of Nursing Mary Gilkey has graduated from a Mental Health First Aid trainer program offered in Boston. She is now certified to teach Mental Health First Aid. It's offered as an interactive 12-hour course that presents an overview of mental illness and substance use disorders in the U.S. and introduces participants to risk factors and warning signs of mental health problems, builds understanding of their impact, and overviews common treatments. Upon class completion, participants are certified as Mental Health First Aiders. The claas provides skills, resources and knowledge to help an individual in crisis connect with appropriate professional, peer, social, and self-help care. The course can benefit a variety of audiences and key professions, including: primary care professionals, employers and business leaders, faith communities, school personnel and educators, state police and corrections officers, nursing home staff, mental health authorities, state policymakers, volunteers, young people, families and the general public.